The University Writing Center (UWC) has a large swath of data about writing consultation appointments. This data comes from the check-in forms and the post-consultation note (in which consultants send a summary of the consultation and its outcomes to the student). The Data Team at the UWC had just been formed two years ago, in an effort to make use of this data. However, prior to this project, the Data Team was only working with the administration at the UWC, and none of this data was accessible to consultants. Our task for this project was to use this data to solve a problem that the UWC administration was facing: consultant note completion rate. However, we decided as a team that this problem would be best approached by treating writing consultants as our primary users. Thus, our problem statement was: How might we help consultants increase their note completion rate? 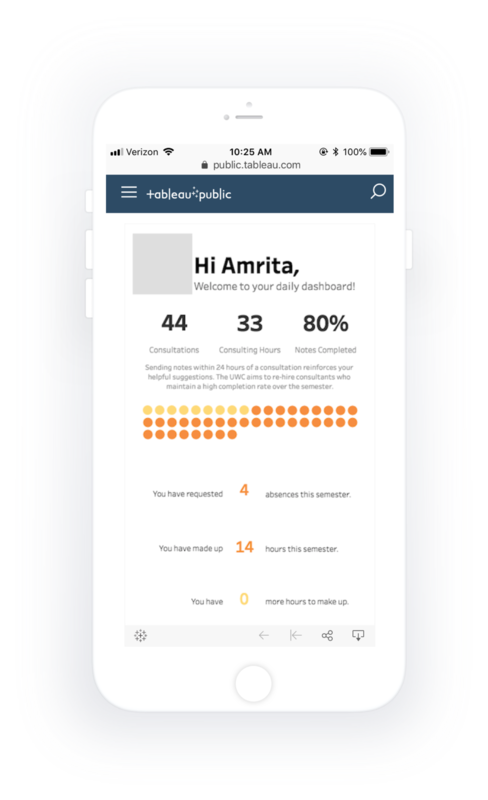 I prototyped 3 iterations of a Tableau dashboard and conducted 11 in-person interviews, which included a usability study portion. The most last iteration was implemented for the new writing consultant interns in Fall 2018. I also proposed and prototyped a mobile app for future iterations of the consultant dashboard. I gained real-world experience reconciling user’s needs with stakeholder needs, which were often times conflicting. I also worked as the only UX researcher and designer on the team, which gave me experience advocating for UX research and developing my own workflow with other members on the team. Allow consultants to initiate contact with their admin mentor when they spotted inaccuracies in the data. However, as a relatively new team within the UWC, we knew that in taking on a project like this, we were running the risk of coming off as serving the purposes of surveillance rather than information. empower our users rather than make them feel as if they were under surveillance. The whole team was familiar with Tableau. The solution must display real-time, accurate data. While we could have opted to use placeholder data, we felt that using real data was critical to eliciting the true response that consultants would have if this solution were implemented. Consultant photo (removed for confidentiality): to personalize the data and to set a positive, individualized tone. Headliner numbers: to communicate significance of workplace experience as well as percentage of notes completed. Note completion policy: to remind consultants that they must maintain a high note completion rate in order to be considered for rehire the next semester. Dots: to visualize accumulation of experience throughout the semester, to show status of note completion, and to show details for each consultation. Yellow was used to represent missing notes, and orange was used to represent completed notes. Contact form: to encourage consultants to initiate contact with their specific admin mentor. Mobile layout: to stay in line with other communication methods at UWC. After speaking with a few consultants about their impressions of the dashboard, they voiced that they face similar pain points with absence requests and would like access to their requests in order to keep track of them. Larger text and dots: for increased legibility and larger touch targets. Absences at-a-glance: high-level information about the number of absences the consultant had requested, the number of hours of those absences that they had made up, and the number of makeup hours remaining. Absences details: by tapping the the numbers regarding absences, consultants could find out the date and approval status of each absence. Navigation tabs: to toggle the view between the dashboard and relevant links, such as forms to submit absence requests and makeup hour requests. Throughout the iterating process, we conducted informal research within the Data Team (who were also all writing consultants) and by asking consultants in the break room about their impressions on having a dashboard of this nature. Overall, what we gleaned from these conversations was that the more useful these dashboards were for consultants’ own work purposes, the more often they would check their dashboard, and the more often they would see their note completion rate. Confirm that the solution addressed consultants’ work needs. Assess how usable and accessible the solution is for consultants. Gain a sense of direction for future iterations. Pull up your dashboard (using the platform of your choice). Figure out how many notes you have left to complete and for which consultations. Send in a makeup hours request. Image shows: why you should always take process pics, folks. Understand how consultants’ feel about having such a dashboard. How do you feel when you see the numbers at the top of the dashboard? What do you interpret to be the purpose of the dashboard? What is your favorite part about working at the UWC? What is the most stressful part about working at the UWC? Consultants want to be good at their job. They prefer to fill out the note immediately after the consultation. The most common reason that they wait to complete a note is if they have several back-to-back appointments, in which case they plan to fill out their note after work, often on a desktop. Consequently, the context in which they check the dashboard will likely be at home, after a busy day. Consultants were surprised and proud to see how many consultations they had completed. Many of them also voiced curiosities about their consultation data: how many consultations they've had with English-Language-Learners, business students, students writing lab-reports, etc. Make it more convenient for consultants to be good consultants. (Without lowering standards, of course.) One factor that may contribute to low note completion rates is that some consultants prefer to complete notes at home, after their shift. However, in order to do so, they have to shift back to a work-mindset, navigate themselves to the right webpage on their personal computer, and find the student’s information in order to submit the note (which is texted to the consultant’s mobile phone when the student checks in). One approach to pushing the project further in this direction is to create a mobile app that provides centralized access to all the consultants’ work-related needs: viewing students’ appointment information, submitting notes, submitting absence requests, and monitoring makeup hours. Motivate consultants to check their note completion rate by providing more encouraging data. A separate project that our team was working on was creating personalized, historical dashboards. The purpose of these dashboards was to provide graduating seniors with detailed information about their entire work history, in efforts to help graduating seniors in their next steps after college. The second insight validated this other project’s purpose, but it also suggested that perhaps the objective of the present project would be most effectively addressed if it was merged with the historical dashboard project. Upon further reflection about the home screen, I decided that although the dots do provide a striking visual representation of the number of notes completed (to show consultants their progress throughout the semester), these dots would be presenting redundant information if consultants’ historical data was also presented in the “My Stats” page. Furthermore, representing each individual appointment with a dot did not allow for easy organization or visibility of information. Therefore, in the next higher fidelity iteration of app, I decided to use cards to represent appointments, allowing consultants to focus on the most relevant information in the home screen.